Across the United States, 19% of students report having been bullied on school property. Bullying is defined as any unwanted, aggressive behavior that involves real or perceived power imbalance. While most reported bullying happens within school walls, a significant amount happens outside of school, especially through social media. When adults respond quickly and consistently to this type of behavior, it sends the message that is not acceptable. Looking for these changes in your child or younger relative could help you start a conversation about what is happening. These warning signs can also point to other issues or problems, such as depression or substance abuse. 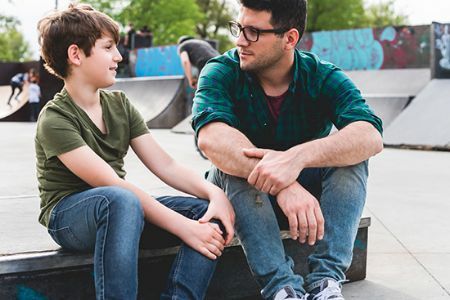 Is My Child at Risk of Being Bullied? More recently, the 2017 Youth Risk Behavior Survey showed that, nationwide, more U.S. high school students who identified as being a part of the LGBTQ reported having been bullied on school property and online in the past year. 10% of these students also reported not going to school because of safety concerns. If your child tells you or expresses concerns about being bullied, listen calmly and carefully. Kids are often unsure if they should tell their parents, teachers or school administrators because they feel embarrassed and ashamed that it’s happening to them. If your child is being bullied, their confidence is probably shaken. Encourage your child to spend time with friends who have a positive influence on them. Helping your child find clubs, sports, and other after-school activities can help them rebuild their strength and find new, close friendships.